Temp in 20s, clear sky, trail well packed down, no snow shoes required. Started from Mill Brook Rd at 8:00 AM, after four hour drive. By 9:30, at Graham turnoff. 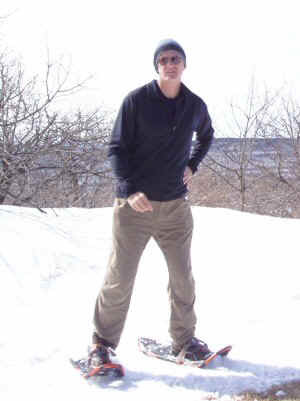 I could only go a few yards -- falling in up to knees or hips in deep snow. Had to return to car to get snow shoes. Back at Graham turnoff by 11:00. Have not seen anyone one the trail so far. But someone coming from the other direction has come by and broken the trail to Graham. 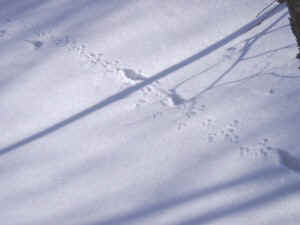 I was grateful to follow the track, because there was no marked trail and the best route was not obvious under the snow. The route stayed to the left of the ridge most of the way, even though the map shows it following the ridge closely. I met the other hiker just whenI arrived at the peak, just as he was leaving. 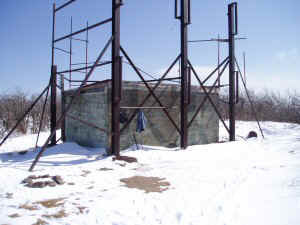 There is an abandoned radio tower and derilict building there. 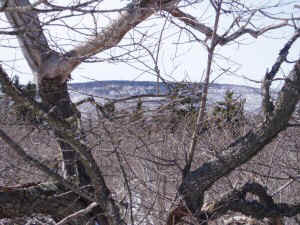 It was possible to spot the fire tower on Balsam Lake Mountain, and there are good views of Double Top and Big Indian, which are probably blocked when there are leaves on the trees. This is one peak with no evergreens on top. Again saw no one until back on the Balsam Lake trail, where I met people on showshoes, skis, and snowboards, all climbing up in the late afternoon. Drove to Fox Hollow Road parking area and hiked in the twilight and moonlight to the nearby lean-to. The afternoon had been warm, and the bare ground in the immediate vicinity of the lean-to was muddy. The nearby spring was gently murmuring. 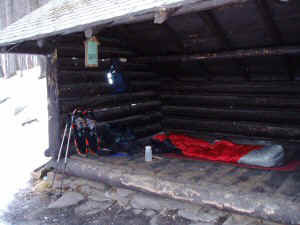 It took me only a few minutes to roll out the sleeping bag, hang up the pack, and get to sleep (at about 7:00 PM). I was so comfortable, I did not wake until 7:00 the next morning. The mud was frozen, the snow that slushy the afternoon before was firm. The sky was overcast, threatening snow. I decided aginst breakfast in favor of a quick getaway. The trail was not broken: there was not even any detectable signs of previous travel. I had to work hard to search for trail markers the whole way. The first part was very steep, then the trail descends. Then it again ascends steeply to the ridge. Clouds all around close in on me, and I can see nothing beyond a few hundred yards. I can always see the mountain ahead of me, steeply rising. It snows lightly off and on the rest of the day. After an exhausting 4 1/2 hours of climbing without a break, I finally reach the summit plateau, where I find a well beaten down path and hear voices. I followed the trail for a few hundred yards to find George and the 3500 club hikers at the overlook. I sat down and had a little lunch and visited with them. Nothing was visible at the overlook except the snow laden clouds. The descent was a little quicker: between the descent and the broken trail Iprogress was much easier. Back at the lean-to by 3:30, I stopped and had the rest of my lunch. As I arrived at the parking lot, the snow was turning to light rain. No one else had made it as far as the trail register that day. This is the most challenging hike I have done so far in the Catskills. 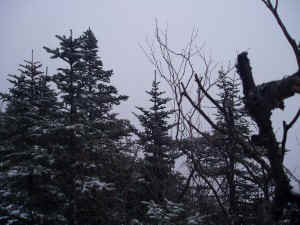 The Bushwhack marathon and the first WCS trip had been as tiring, this was unique because I was hiking solo, breaking trail, on an unfamiliar route in the snow, with no visibility of surrounding terrain to orient me.